- Where weather meets the eye. For more than 25 Years. You are most welcome to TriVis-booth 7.D47 from the 14th till the 18th of September 2018. 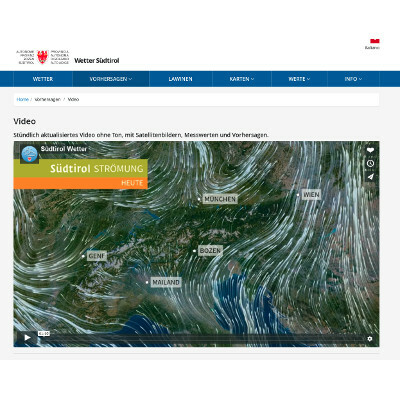 Meteo Alto Adige included TriVis Weather Graphix into their daily workflow and is presenting new, high quality content to the public on their website. Ompreop Flevoland is applying TriVis Weather Graphix including its highly efficient and easy-to-use components. It is fully integrated, adapted to the lean workflow and operated as one-workplace based fully integrated system. 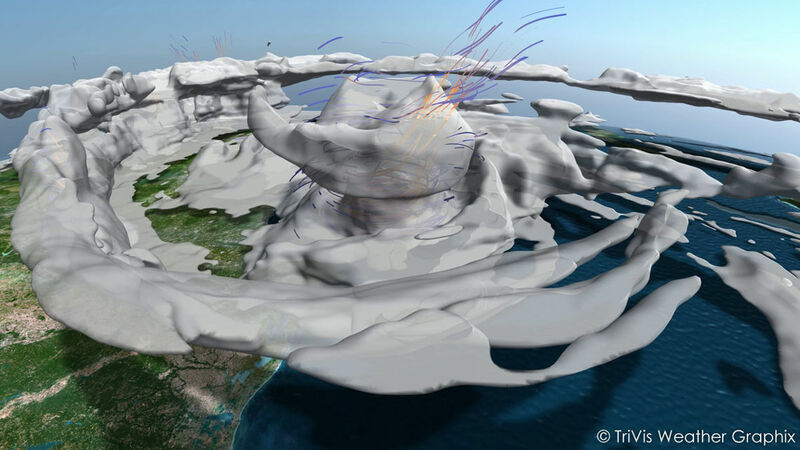 TriVis is the most powerful graphics solution for the visualisation of meteorological data for all digital media. 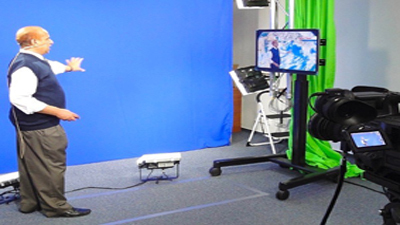 It guarantees a very cost-effective and flexible production of weather shows. Its complete feature-set including the latest 3D computer graphics meets all demands of heterogeneous production environments. It can produce any weather situation imaginable in 2D or 3D. TriVis can produce various formats such as still pictures, dynamic graphics or complete films. It supports many different data and forecast models of numerous meteorological services. 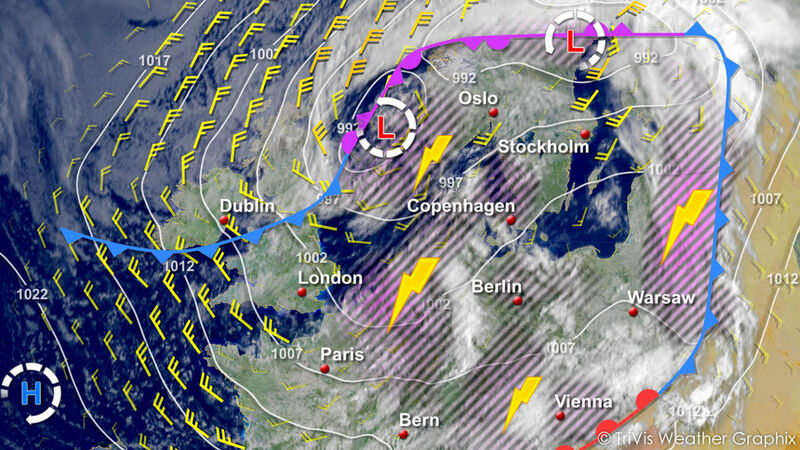 Interactive lettering, symbols and even animated meteorological frontal systems can also be visualized. 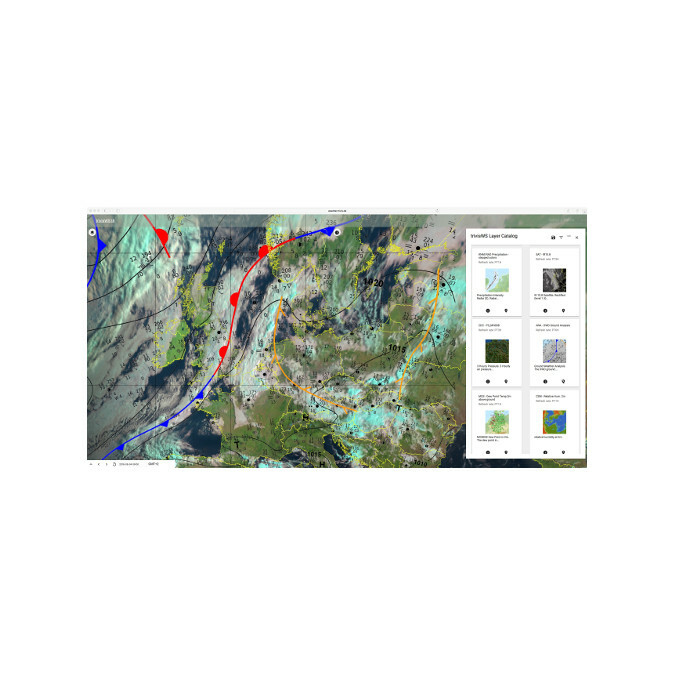 TriVis is your easy-to-use professional tool for creating sophisticated weather shows. Flexible interactive creation or adaptation of content meeting the requirements of the quick news and weather worlds supporting for example direct reaction in global significant weather situations. Content produced with TriVis has premium broadcast quality for HD, 4K and beyond. 3D scenes are always fully anti-aliased. Also vector output can be produced by TriVis for best possible quality in print. 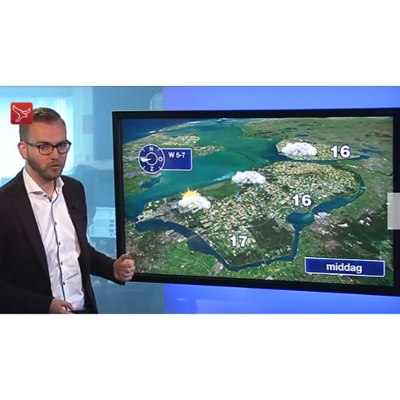 Offers fully interactive touchscreen solution and a PlayOut module giving full control to the presenter at all times during the weather show. Wireless triggering and remote control of studio robots are possible. TV stations and weather services worldwide broadcast graphics from TriVis with legendary reliability since over 20 years for interactive storytelling and unattended 24/7 automated production. When it comes to weather graphics for different media we offer the complete range of products and services for customers from the broadcast industry and from national as well as private weather services. Let us produce the weather for you! The weather has always been a striking part of a TV program. A first-class weather show that really draws attention. Our professional content production service is suitable for TV, social media and digital signage. We produce content that you select and play live. You operate the TriVis components TriPlay or TriTouch. Enjoy maximum live experience with the professional weather content that we produce as a service for you. Broadcast your TV show easily. 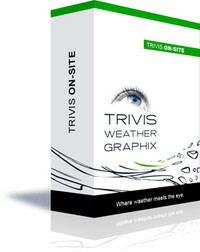 If you prefer a local graphics production on-site we provide the right software for you: TriVis Weather Graphix. This allows tailor made weather stories created by your meteorologists depending on the daily weather situation! For you as for all our customers we provide a wide range of services from hotline support, nursing period over tailored graphics modules to education here in our training centre in Darmstadt or for your teams locally in your office facilities. 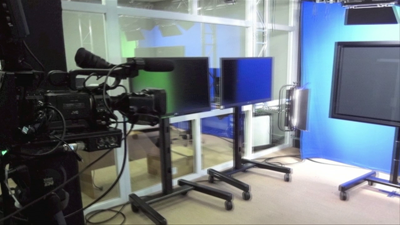 Depending on the requirements of our customers we also deliver turnkey broadcast solutions including a complete television studio together with the on-site installation and all corresponding trainings. Our customers in this case just provide empty rooms with electricity and simple computer network for the supply of weather data and the dissemination of complete weather forecast videos. A fibre optics video link is optional. 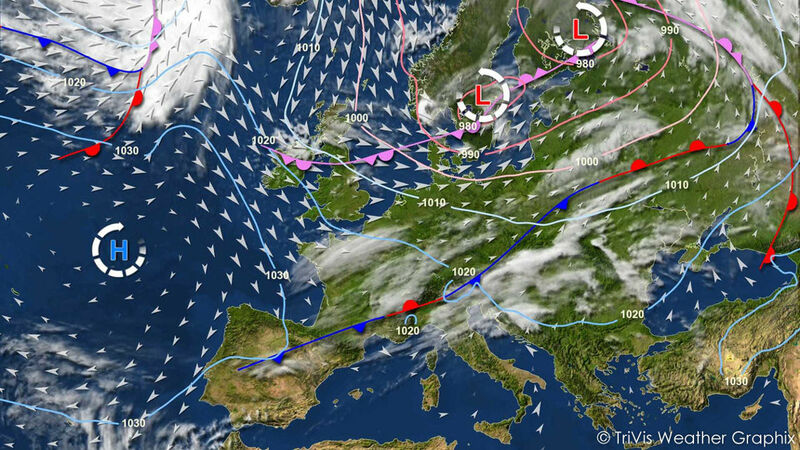 The visualisation of the meteorological data as well as the real-time playout is performed with TriVis Weather Graphix. 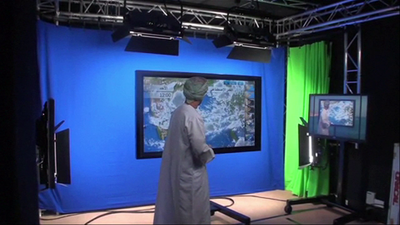 Multi-camera set-ups are possible as well as touchscreen solutions in Chroma-key environments and much more. Contact us to see how we can also help you to leap into the weather content creation world! TriVis is available in different packages to suit all budgets and requirements. At any time customers can up- or downgrade when budgets or requirements change. For example, a customer who started with a graphics production service contract can upgrade to local software operation inheriting the existing design. Furthermore a customer making use of our 24/7 support during a nursing period can downgrade the service when local capacity has been build up. trivisWS is our new service TriVis Workstation! It represents the lightweight web-based service-oriented meteorological workstation of TriVis Weather Graphix. From mobile devices and desktop computers users can conveniently access all relevant weather information from different sources combined in an integrated interactive map view. 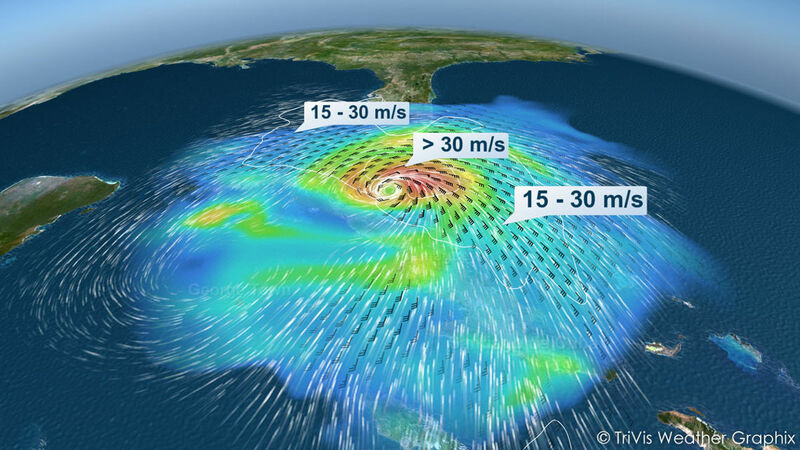 TriVis Workstation brings to the users’ finger tips such data as historical climate information, current observations and weather analyses, and also forecast data. Map view and tabular display are supported. The trivisWS maps consist of different data layers that display information from different sources. With a button-click the user can open the Layer Manager for the management of the map and data layers. The Time Selector is available to choose different time steps or to step through the series of available data time steps. A calendar element makes it possible to directly jump to a given date and time. Interactive zooming and panning in the map is possible at any time. By pressing the Data Catalogue button the user gets access to all available sources of weather information. By means of the filter option the user can reduce the list of available sources to a task-specific sub-set. For each element additional detailed information can be displayed. Additional data layer can easily be superimposed and favorite layer combinations can be stored. Raster data and point data can be combined. 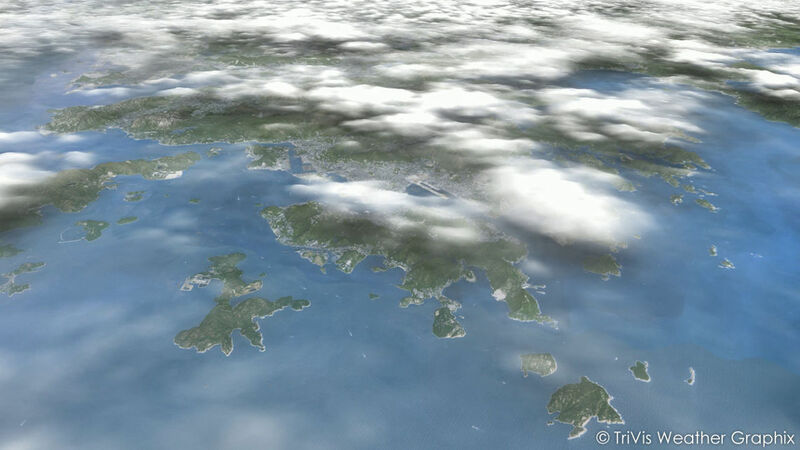 A level-of-detail mechanism increases the number of visible weather stations when the user zooms closer into the map. Different time steps can be chosen for all displayed data layers. A table view is available for the currently displayed weather stations. The values in the table can be sorted by a weather data parameter such as temperature for example. It is possible to download the currently visible table or to view a meteogram line/bar chart for a selected station. It is possible to pick a displayed station to let the system show the related weather information in a pop-up display. trivisWS is available as a service where clients get access to dedicated and maintained servers. It is developed for all users that need easy and quick access to global weather information. Please find below answers to the questions we are most frequently asked. Yes. TriVis Weather Graphix is used in daily operational weather productions since December 1992. Since then it has successfully produced on-air weather content for broadcasts every single day without exception. Most of all: No on-air failure was yet caused by TriVis. Yes. By applying the most modern computer technology TriVis guarantees the highest possible graphics quality in all its media products (see below). This includes smooth 3D flights, terrain visualisation with a resolution of up to 2.5 metres, complex 3D objects, realistic shadows, animated reflecting water surfaces and much more. Of course, all output is created with industry leading full-scene anti-aliasing. 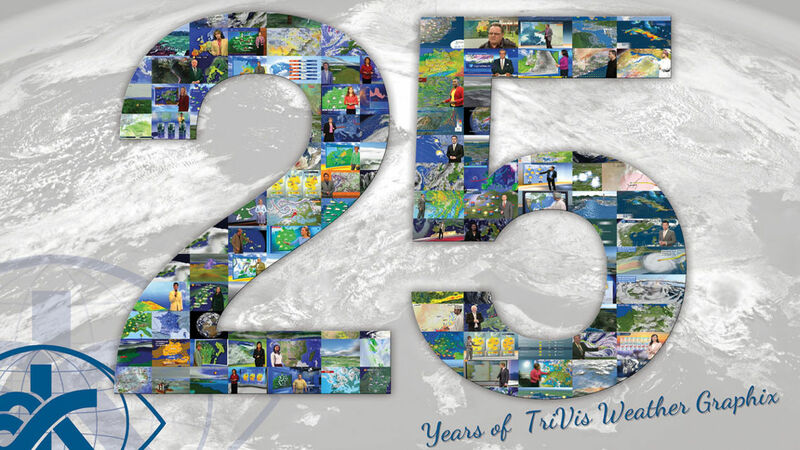 TriVis Weather Graphix is operated 24/7 from Scandinavia to South Africa and from the Caribbean across the Middle East to Asia. Customers can choose between different support options. For example phone and mail support, help forum access and online ticket system interface are available. 24/7 service can be booked as an option also globally. To achieve maximum reliability (see above) TriVis production is operated on Linux systems (e.g., RedHat, CentOS, OpenSUSE). To achieve maximum flexibility in the studio environment, the touchscreen component of TriVis is operated under Microsoft Windows. Daily, TriVis is operated to produce a wide variety of different media: Broadcast media for TV and social media, maps for online and digital signage, vector output for print (newspapers) and geo-referenced graphics layers for WMS/WFS applications. National and private weather services make use of this possibility to create cross-media output very efficiently. Broadcast content can be produced up to full 4K UHD. For our customers we have developed and are maintaining a very mighty data ingest interface. This allows to import, process and visualise weather data from a wide variety of sources in the most common WMO formats such as GRIB1/GRIB2, BUFR/TAC etc. In addition, TriVis can ingest GeoTIFF, ESRI shapefiles, ECW and more. TriVis most flexibly integrates into modern heterogeneous production environments at broadcasters and weather services. This is achieved by providing interfaces to newsroom automation (Mosart etc. ), virtual studio systems (Vizrt etc. ), desktop publishing systems (InDesign etc. ), web mapping systems (Geoserver etc. ), social media (YouTube etc.) and more. Our customers achieve maximum benefit for a very reasonable total cost of ownership. For example, TriVis fully automatically operates a weather channel by generating and distributing the graphics content in 24/7 manner. Furthermore, TriVis is used to daily create over 100 newspaper products each in a different design from a single source of data. The high degree of automation and the low requirements for maintenance result in the most effective use of staff and equipment ressources. Depending on the requirements of the customers, TriVis Weather Graphix is available as a service (production of content in our computing centre), as a software-only package (customer provides hardware infrastructure) and as a complete turnkey solution (software together with complete equipment including full TV studio if required). As an alternative to the TriVis Realtime Playout solution the also available TriVis Touchscreen solution can be installed. 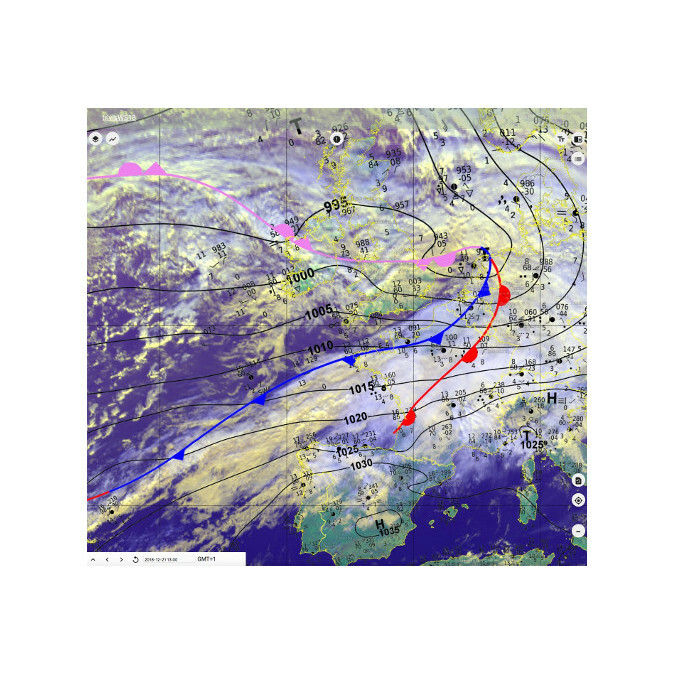 This fully interactive real-time operated software allows the presenter to superimpose the weather data above the globe, draw frontal systems and set high / low pressure symbols. All that is needed for such a set-up is a touch-sensitive display, which is connected via USB and HDMI to a suitable standard Windows PC. We are a company for innovative visualisation solutions, automated document generation, and broadcast computer graphics.